Horny tumors—Cornua Cutanea—Horny Excrescences—Cornes de la Peau— Production Cornée. Journal : Photographic review of medicine & surgery ; vol. 1., no. 1. Description : pp. 2-7,  pl. ; ill.: 1 photo. ; 24 cm. Subject : Skin — Cornii. Author caption: "BY WM. H. PANCOAST, M.D., Demonstrator of Anatomy, Jefferson Medical College, Surgeon to the Philadelphia Hospital, and Surgeon to Charity Hospital, etc." First president of the Medico-Chirurgical College of Philadelphia, 1886-96. Reference: Gould, George M. & Pyle, Walter L. (1898) Anomalies and curiosities of medicine. London: Rebman (p. 226). 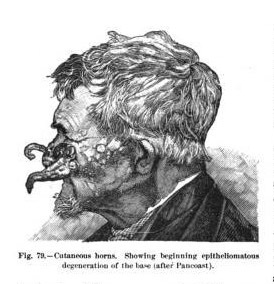 Reference: Henry (1871) American Journal of Syphilography and Dermatology. NY: F. W. Christern (pp. 168-170). THE accompanying photograph is that of Capt. Levi Becket, a resident of Atlantic City, New Jersey. The horny tumors were photographed on his face by simply tying them on in the position from which they fell, he having come to me with them in his hand.